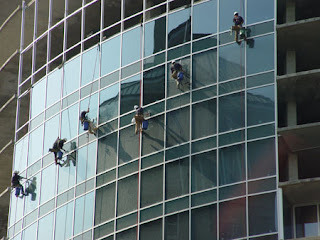 Our commercial window cleaning services in atlanta are professional and affordable. When comparing our professional window cleaning services to those of other window cleaners, our commercial window cleaning services are often considered to be superior by our clients. We focus our commercial window cleaning business to cater to the needs of our professional window cleaning clients. We believe that commercial window cleaning requires a professional image, dedication to high rise window cleaning safety, and also getting the window cleaning job done right the first time. Top of the Line has performed high rise, low rise, residential and commercial window cleaning Since 1990. Over the years, we have partnered up with window cleaning companies in markets throughout the US in order to extend our service network. Each company within our service network is prescreened to meet stringent specifications for quality service and professionalism. Select your area on the map to find a local service provider. Top of the Line provides interior and exterior, high- and low-rise window cleaning services. Our window cleaning will leave the appearance of your windows better than you or your tenants can imagine. After our services are performed, customers often compliment on the improved working atmosphere generated from the enhanced clarity of the windows. We specialize in high quality, state-of-the-art window cleaning that will not cause costly problems in the future, but will keep your building looking better longer. We useScumfrees Professional Window Cleaning Concentrate and Deionized Water that leaves little to no residue compared to commonly used dish soaps and tap water with a high mineral content. Unfortunately, these industry standard methods can actually create the glass stains seen on most building windows today. At Top of the Line, we have determined the right formula for keeping your windows clean and stain-free. Furthermore, your windows will remain cleaner longer; each time it rains, sticky residue will not be washed down from the ledges onto the window below. More information about the cause of glass stains can be found atwww.IsYourBuildingGreen.com. Or to download a brochure that explains the complicated matters of exterior building restoration and maintenance and how properties can save millions on implementing Top of the Line's new and improved technology click the link below. To obtain more information about our window cleaning services or to Request a Proposal, contact us and a building maintenance specialist will return your inquiry. Many times we are called by a new customer and asked if we can do window cleaning only to find out that glass restoration is the service that is needed. Standard window cleaning procedure involves gently scrubbing the window with a brush soaked in water and a diluted window cleaning detergent. A squeegee is used to remove the dirty mixture from the glass with precision and towels are used to clean the edge of the windows and the frames. Glass restoration however can involve the use of motorized polishers, chemicals and or abrasives and is much more labor intensive and costly. Restoration of window glass can cost 100 to 500% more than standard window cleaning. To learn more about glass restoration. The picture below is a before and after picture of a window that has been restored using Top of the Line's products and processes. As you can see the difference is very noticeable. Standard window cleaning would not remove the stains on this window.